Cummings Termite & Pest is an independently owned company established in 1972. Our primary focus is delivering superior service to our customers. We service the Fountain Hills, Mesa, Gilbert,Tempe, Cave Creek, Carefree and Scottsdale pest control needs. Service is ultimately the single most important dynamic in which we have 100% control. Communication, execution, and urgency are pillars of who we are as a company. This commitment has established our reputation as a customer-centric firm, knowing that we too are consumers and just as you expect results, we are energized upon achieving them. Pest management companies are not permitted to create new pesticides. Creation of pesticides and formulation of remedies are left to the manufacturers. They are required to follow an intensive research and development criteria lasting several years before the EPA grants permission for commercial availability. Simply, there is no magic bullet or product exclusive to any one company. Pest management firms are all granted access to the same products. Our responsibility is to know which products to use and how to utilize them in any given circumstance. Our experience and product knowledge, coupled with superior customer service are what separates Cummings Termite & Pest from other pest management firms. 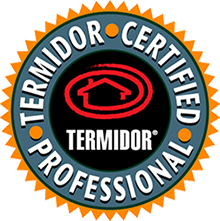 Our company is committed to preparing all of our technicians to meet the challenges that are inevitable in the pest management industry. Technical comprehension (definitive and data-based). By taking advantage of manufacturer training, professional lectures, and industry resources, our technicians remain at the forefront of technical application. Communication (artful and interpretive). We recruit technicians who have solid communication skills; we train them to use their technical knowledge to explain the recommended pest treatment solutions to solve existing problems and take proactive measures to remain pest free. This focus separates us from our competition. We establish clear expectations for our services as well as timelines for follow-up if required. Cummings Termite and Pest Control is constantly reviewing industry best practices to deliver the most up to date solutions. We fully recognize the gravity of implementing pest control solutions. Our attention to detail, concern for the home or business owner and the creation of a pest free environment are foremost in all business goals. Every employee of Cummings knows and understands our commitment to customer service. We want our customers to know the people working on their behalf. That is why we employ an office staff to field customer queries and why we encourage our technicians to question, listen and understand their clients’ needs. This commitment to customer service is why I am also available to visit any site should a particularly challenging circumstance occur. We are accessible, and we are ready to serve you.